7:54 p.m. Today didn't go so well for me to start. And I just woke up and kept thinking over and over to message that Josh dude something really important and meaningful...and I just got up and did it. The profile looked abandoned..ish. So I just sent a friend request. Sent a message. Assumed he'd not see it for some months or years. Nope. He saw it right away. Asajshdsgfhgfhgjdhgfhdgfhdsgfjgdsfhj. In the biggest flippidity-do-da sense!!!!! And now I'm nervous...actually getting less nervous. I totally expected him to say something back. He didn't. But he did react with the hearts smiley face symbol. So hey. I guess that's okay. I'm like....tingling nervous. Way nervous. Especially cause he just asked how I even found his profile. Not stalking, I assure you. As you recall, I made a personal point to myself of not doing that. I just had like this meaningful message to say and whatnot and didn't even think he'd see it until a REALLY long time later. He said he 'kinda' remembers me. Which again, it's understandable. I was a kid and looked nothing like I do, now. "Oh, I just happened to have remembered your first and last name after all these years and decided to look you up on Facebook. It stuck with me for the days following..because it was bringing back the childhood memories I have of you cause they were actually small, but pleasant parts of my troubled childhood. 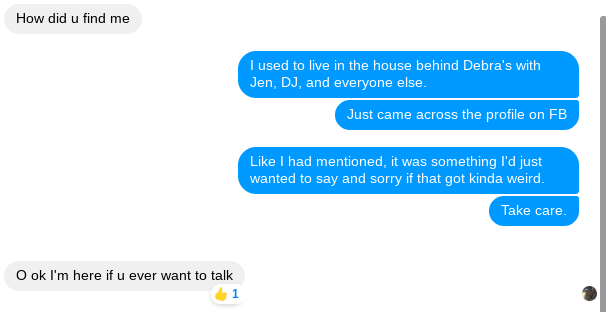 And then I decided to message you and friend request you out of the blue, cause I woke up and kept repeating what I would say if I ever talked to you again, line for line, in my head over and over. 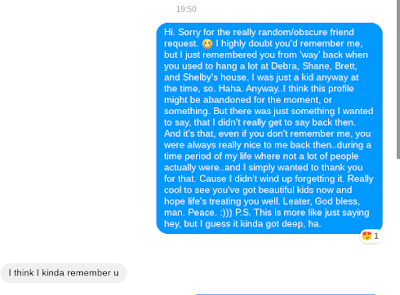 So I got up, looked up your profile again and then messaged and friend requested you out of the blue to say this really deep and emotional thing I didn't think you'd find for months or years later until I'd practically forgotten I wrote it." Yeah, cause that doesn't sound really uncomfortable for the person on the other side? Nah. No, thanks. I think I'll just keep my answer simple. I just...came across the profile. Which, I guess, technically, I did. By looking up the name. -_- No way am I gonna be that...um...what's a more polite word for creepy? Gah, this is weird. Weird, weird, weird. It got weird. I mean, I'm glad I got to say what I wanted to say, and feel like I was meant to say it, but it was weird. It got weird. Awkward....asghasghjagshahs. I decided to try and politely end the conversation. Hopefully it can end on a normal, very non invasive, looking note. Eh? I was just kidding with that picture. It gave me a much needed laugh. While he invited me to talk sometime, at the moment doubting I would. Cause...we don't know each other, like at all, or anything. And I think it's something polite some people say to say goodbye and if you really do go and unload, not that I need to, on a complete stranger, well then it's just awkward for everyone involved. Believe me, I have experience to fall back on with that opinion. Nah. Breathe. Just breathe. It ended on a nice note. I said the thing I wanted to say. He accepted the friend request, not that he had to or...anything. I'm a nervous and awkward human right now, oh my goodness. This is kinda ridiculous. Me, I mean. Good thing this blog is as obscure as it is. Oi. I didn't really have a great day to start. My thoughts pretty much went where they shouldn't have. Again. And I just was in bed most of the day. A lot of..you know..twisting otherwise happy looking stories into some seriously interwoven plotted dark ones. It got pretty ridiculous. Another highlight was I got a neopet trade I wanted, and practically waited all day on. I'm calming down. It was just kinda repeating in my head for days in some various ways or even subconsciously so on the plus side, it was better for me to get it out. Cause also I think I was meant to, it was a blessing-kind of message...and now that I did. I...did. At LEAST in hindsight, maybe it's a good thing he reacted/answered, after all. Even though it took me aback a moment. Just cause now I won't have to have some anxiety brain thinking up all these things I'd think he'd say back, and instead just have what happened right there. That makes me feel better, too. 8:30 p.m. That big chunk in italics got added, after the fact. I kept the conversation nice. Appropriate. Thank God. Not sure if I'd want to chat, again. Eeeeeee...not that it's him. It's me. But man, am I being a bit much right now. 8:51 p.m. Going back and cluttering this with reaction GIFS makes me feel so much better, bruh. Like, dude. >.> Hopefully this blog is as unknown as I think it is. Ughhh.....life's journey. It is what it is. Big things. Small things. Hugely awkward and surprising things. Yeah, let's not have that...be a thing. :P Cause I...that..this whole thing has been weird. 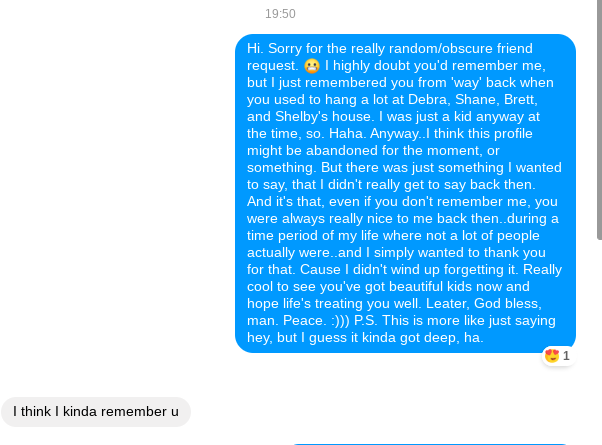 Just finding some dude's profile you happened to remember and messaging him out of the blue..just. For the record, I knew him from back in early high school. You're talking like 2003. Yeah. This isn't a stalker thing. I don't want it to look like some kind of stalkerish thing. Cause..it's really not what I'm tryna' do here. I think too much. Forgive me. Just wanted...again..to say the nice message and run off. :P The original intention. It's just the way I went about things would certainly be weird for the person on the other side, and understandably so. And all I wanted was to leave a simple message..so I think something like that may be okay??? Maybe. Sure. I'm assuming so. From my end. Ugh. I'm so awkward over this little thing...man. -_- Dude. 9:19 p.m. Feeling better. I spazzed to April over this and went back to the profile and now I know why I thought it looked abandoned, cause it was private. He's in a happy relationship with a bunch of kids. Good for him. Happy for him. ^_^ I feel better and wishing him well, in Jesus name. 9:23 p.m. Now's the part where I get to smile and feel so silly for getting my emotions needlessly in a tizzy. :P Hahah. I'm doing okay. 10:03 p.m. I think in comparison to earlier today and some days, my mood is literally sparkling right now. I guess this really needed to happen. I'm better. :P I blared and sung out loud alone in the house to twentyonepilots and got a good shower in, and sung some more. Very interested to see what meditation throws for me. Also, to throw this out there, thankful to God I don't feel like I ever need any mind/mood altering substances to get to a healthy emotional state. Or to vibrant imaginations. I've already well learned there's nothing those things could give me, that God couldn't give me more of, with all good and blessing, and hope in Jesus name, Amen! God is able to do abundantly above all we ask or think. Also, aside from this, my lower back is killing me. Bad mattresses for long periods of time. And age and health, possibly. But that is well enough to get past and doesn't overshadow this wonderful blessing. 12:15 a.m. Deep breath. Cause everything's okay. Talking with my friend on neo and hanging out with mine here. Had burritos and ice cream. Completely chill. I love when the day turns around for the best into evening. Then again, why should I expect that it wouldn't? God's always gotten me through, after all.